Just when I think we've seen every story about World War II that could be told, every story about the horrors of the holocaust, every story about all the different participants in that war, along comes a film that proves that once again how unbelievable it all was and how many stories there are still to tell. 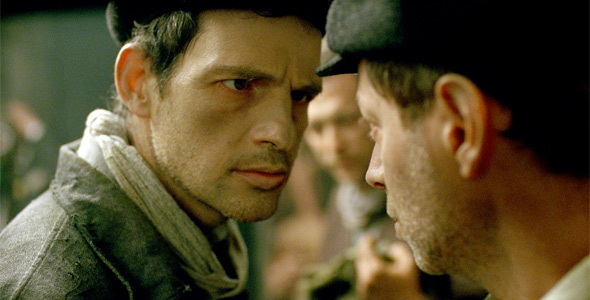 Son of Saul is one of this year's films set during WWII, specifically set at the Auschwitz-Birkenau concentration camp near the end of the war. It follows, literally, a Hungarian Jewish man named Saul around the camp as he works as a "Sonderkommando", an insider who helps the Germans at the camp carrying out their mass murdering in exchange for an extended life at the camp. This film is harrowing, hard to watch at times, but a masterpiece - and I'm talking about this being a best of the decade kind of film, not just best of the year. I was impressed by every single aspect of this film, but to start, what I noticed first and foremost was how chillingly realistic this is. We're watching Saul, played by Géza Röhrig, and the other "Sonderkommando", participate directly in the devious act of ushering incoming Jewish people into the gas chambers while lying to them about how they'll be given a job after. The hierarchy of the prisoners compared to hierarchy of the Nazis, the structure of the camp, the way they worked efficiently to exterminate mass amounts of humans, it's all accurate and sickening. So accurate that I found myself wondering if this kind of accuracy has ever been portrayed before on film, because I can only think of films like Schindler's List or Sophie's Choice or The Pianist, and they've barely included such subtle details as who reports to who amongst the prisoners. That's the thing about this film - the attention to detail is impeccable. From the way prisoners look at each other based on their status, to the way trading worked in the camp, it was extremely impressive. But the film is much more than that. The film is about Saul, a Hungarian who encounters a dead boy in the chambers and suddenly must figure out how to give him proper burial. This sets him on a mission to find a Rabbi in order to give him that burial. Saul desperately navigates the camp, working deals with other prisoners in an attempt to find a Rabbi who isn't about to be killed. It seems like a futile effort, but the look on Saul's face keeps us enraptured and intrigued. Will he find one, will he get in trouble? It's hard not to feel the same emotions he is – a need for survival. And now, a need for closure for someone that means something to him. The other extremely impressive aspect of Son of Saul is the way it's shot. The cinematography by Mátyás Erdély focuses entirely on Saul's face center screen, or follows him from behind, never at all focusing on anything else. All of the disgusting things around him happen in the sides of the frame, in the peripheral, and it makes it all the more powerful. Because here they can actually show, without cutting back for the sake of cinema, just how horrible these concentration camps were. I wasn't sure if this cinematography would bother me at first, but within only 20 minutes of following Saul around, I was ready to proclaim this a masterpiece based purely on how effectively visceral it was to watch. We think we know how bad it was in these places, but we have no idea. Instead of making us look directly at those horrors, we are forced to watch the face of a man experiencing it all around him first hand, holding back his emotions or he'll be killed, too. There are no flaws to this film, it's perfection. Well, except maybe the ending, which went on for perhaps 20 seconds too long. It could've cut to black right before at that one moment (you'll know the one) and I would've immediately started clapping in admiration. But still, this ending hits you right in the gut – and it makes you think even more intently about everything you just saw. It makes you realize that this is the actual experience of one man in the concentration camps, this was what life was like to be there. Very few people have ever been in a situation where we are so desperate for survival every minute of our lives that we have no option but to emotionlessly work for the enemy and do the very things we despise. That's why this film is a masterpiece – it captures that essence in such a brutal, harrowing, remarkable, unforgettable way. I can't speak enough about how phenomenal this film is. It's not an easy sell. Convincing anyone to go watch a movie set in a WWII concentration camp is already tough, and it's so brutal and sickening at times that some will simply not be able to sit through it. But I encourage everyone to try, bravely attempt to never look away, and learn from this experience. After years of using schools assigning Spielberg's Schindler's List to teach kids about the holocaust, it's time to switch that film out with Son of Saul (or perhaps just add it as mandatory viewing as well). Not only is it just as moving of a story, but it's even more accurate regarding history, and shows in great detail the many aspects of these terrible camps. Son of Saul is a shining example of how cinema continues to evolve and improve every single year. There are still masterpieces being made. WOW! Another "10/10"??!! Incredible. This has become an instant must-see for me. It sounds like a "one-and-done" but oh, how I love my one-and-dones. On my list probably. But i always have a big problem with watching this kind of movies. It's so terrifying and it realy happened, gives me realy bad dreams. I'll make sure to see it. It feels like it's in the same category as Amore. A movie that, because of the depressing and harrowing subject matter, won't have me sprinting to the theatre to happily see it. But like Amore, I wouldn't want to miss out of seeing one of our decades greatest films. Thanks for the review!